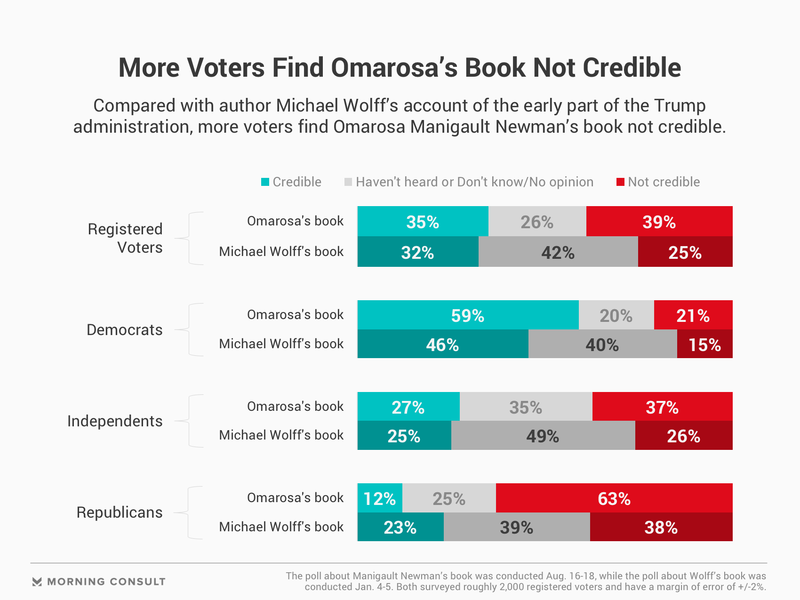 39% of voters say Manigault Newman’s book is not credible, 35% said it is credible, and 26% had no opinion or had never heard of it. In January, 25% said Michael Wolff’s book was not credible, 32% said it was and 42% had no opinion. Omarosa Manigault Newman’s new book, “Unhinged: An Insider’s Account of the Trump White House,” has topped the New York Times’ best-seller list as the former reality show contestant and Trump administration official hits the airwaves with details about her time in President Donald Trump’s White House. Compared with the Jan. 5 release of author Michael Wolff’s controversial account of the beginning of the Trump administration, “Fire and Fury: Inside the Trump White House,” more voters are aware of Manigault Newman’s book and have stronger opinions about it. Along with more awareness of the book came stronger views on its credibility, according to the latest poll, which surveyed 1,974 registered voters in the days following the Aug. 14 release of Manigault Newman’s book. A 39 percent plurality said Manigault Newman’s book was not credible, while 35 percent described it as credible. When it comes to Wolff’s book, the share of voters in January who described it as not credible was 25 percent, while 32 percent said it was credible. A 42 percent plurality said they didn’t know, hadn’t heard of or didn’t have an opinion of Wolff’s book. Among Republicans, 12 percent view “Unhinged” as credible, compared to 63 percent who said it is not credible. In January, 38 percent of GOP voters said Wolff’s book wasn’t credible. Robert Thompson, director of the Bleier Center for Television & Popular Culture at Syracuse University, said that while both authors took part in ambitious marketing campaigns to promote their books, Manigault Newman, who first came to the public’s notice on “The Apprentice,” “had already been a household name for over a decade.” Both authors, he noted, have faced questions about their credibility. The January release of Wolff’s book was a major news event, drawing unmet demands from the president’s legal team that the book’s publisher, Henry Holt & Co., halt its release and leading to the departure of Steve Bannon as chairman of right-wing website Breitbart News. Trump’s lawyers have made no such calls about Manigault Newman’s book — and so far, there are no prominent careers suffering because of it. But in her promotion of the book, she has taken big shots at Trump in national television appearances. Manigault Newman alleges Trump has used the N-word and said it is on tape (Trump denies using the racial slur). She has also said she has tapes of conversations from her time on the campaign and in the White House, and released one that purports to be her own December firing by White House chief of staff John Kelly. Trump has repeatedly used similar language – such as “like a dog” – to refer to people being fired, including tweets about journalist David Gregory, conservative activist and commentator Erick Erickson, Bannon and even Sen. Ted Cruz’s 2016 presidential campaign communications adviser. But some expressed outrage at Trump’s use of the word to describe Manigault Newman, a black woman. Shown the tweet, 49 percent of voters described it as sexist, compared to 41 percent who said it was not. Forty-seven percent of voters said the tweet was racist, while 43 percent said it was not. Among African-Americans, 69 percent said it was racist, compared to 19 percent who said it was not. More than half of voters (51 percent) described Trump as racist in the latest poll, up 6 points since a survey conducted last month. That includes 65 percent of Hispanic voters and 76 percent of African-American voters. The survey’s margin of error is 2 points.